The NYCWP is thrilled to announce that it will revive its Summer Opens in July 2015. Summer Opens consist of four full-day professional learning workshops for teachers of all grades and content areas. 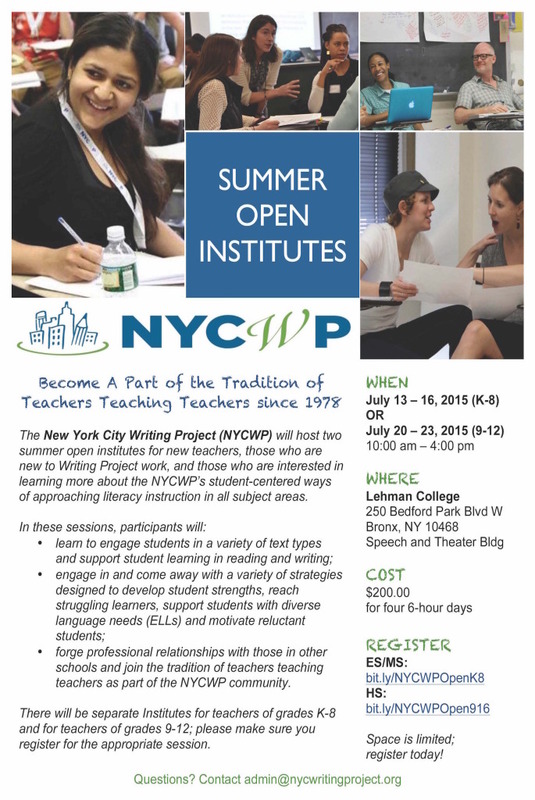 They are specifically designed for new teachers, experienced teachers who are new to Writing Project work, and/or those who are interested in learning more about the NYCWP’s student-centered approaches to teaching literacy. Unlike our Invitational Summer Institute (ISI), which is by application only, Summer Opens are available to all interested participants on a first-come, first-served basis. The cost for the full cycle (20 hours) of professional learning is $200. We will serve high school teachers in our HS Open, which runs M-Th, July 20-23, from 10:00 am – 4:00 pm. Teachers of grades 9-16 (all content areas) should register at bit.ly/NYCWPOpen916.